One of the largest flotillas of Nato warships to dock in Belfast has arrived after holding a joint exercise off the west coast of Scotland. 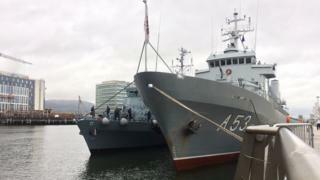 A number of ships, including two frigates and minesweepers, will dock in the city over the weekend. The first of the ships arrived on Friday morning. They are from the navies of Latvia, Germany, Belgium, Norway, Estonia and the Netherlands. The courtesy visit will allow the crews some shore leave and also include a chance for the public to see the naval ships up close.